A JCU law student has been selected to attend the Organisation for Economic Cooperation & Development (OECD) Annual Forum in Paris later this month. A James Cook University law student has been selected to attend the Organisation for Economic Cooperation & Development (OECD) Annual Forum in Paris later this month. Dylan Carey, a final year Bachelor of Laws student at JCU in Cairns, will join five other young Australians who will make up the Global Voices OECD Australian Youth Delegation and receive a fully sponsored package to attend. The OECD is an international organisation comprising 34 countries with the aim of improving the economic and social well-being of people around the world. Its Annual Forum brings together a large range of stakeholders to discuss pressing international issues. Mr Carey is one of three Queenslanders in the OECD delegation but the only JCU student and the only one from Cairns. Mr Carey, who has lived in Cairns for 20 years, said a friend gave him the idea of applying for a spot on the delegation. “I was given notice of the trip through a good friend, who is also interested in international relations, who thought it would be an amazing opportunity for me and incredibly relevant to my interests,” he said. Mr Carey, who currently works in office administration at Joe Vella Insurance Brokers, has a keen interest in international diplomacy, policy and relations as well as youth engagement. Mr Carey said he was interested in the long-term aim of building trust to create resilient economies. “Attending this forum will allow me to put my skills and knowledge of economics and development into practice,” he said. Along with the other OECD delegates, he will complete a Research Fellowship with Global Voices as a part of the delegation experience. This will include the production of a paper on an aspect related to the forum’s agenda, to be published by Global Voices. Mr Carey said the process of applying to the delegation was very challenging. He also had to write a 500-word paper on why he should be chosen for the position and what qualities or skills he could bring to the delegation and how he would put the things he would learn and experiences he would have into practice after returning from the conference. Mr Carey said he was in a meeting at work when he received the phone call to say he had been selected. Paul Mitchell CFO of Global Voices, said it was a “once-in-a-lifetime” opportunity for Mr Carey. 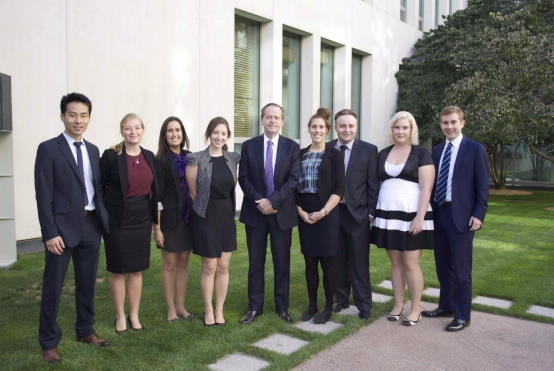 Established in 2011, Global Voices is a non-profit organisation which provides opportunities for young Australians to engage with international policy both at home and abroad. It does this through regular events and research and development opportunities at home, along with the coordination of youth delegations to important diplomatic forums abroad.